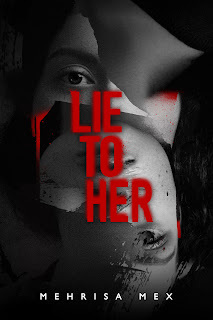 The Blurb Blitz Tour for LIE TO HER by Mehrisa Mex stops by Readeropolis today. The psychological thriller is available now. LIE TO HER will be FREE on Saturday, March 31! This post is part of a virtual book tour organized by Goddess Fish Promotions. Mehrisa Mex will be awarding a $10 Amazon or Barnes and Noble GC to a randomly drawn winner via rafflecopter during the tour. Click on the tour banner to see the other stops on the tour. She drew out a baseball bat from the cupboard and gripped it tightly. Then she swung it at the camera on the landing until she was sure she had destroyed it. She thundered down the stairs and knocked out the one in the hallway. She then went about smashing the one in Myles's study. She was out of breath by the end of it, but also completely exhilarated. Now out of view of any detectable surveillance camera, she went over to his desk drawer, which was locked. She hoped the gun was still in there and she tugged on it on the off-chance that it was a bad lock. No such luck. With her hands shaking from the adrenaline, she pulled the hairpins out of her jeans pocket and laid them out on the desk. Her eyelids fluttered as she surveyed them. What was she thinking? She couldn't do this. You've done it before a hundred times. "That was years ago." Her days of picking locked liquor cabinets were long past her. You can do this. Or, I can do it for you. She bit the soft end off one of the hairpins and pulled it apart while bending the rounded end of another pin into a lever. She pressed the lever hairpin into the lock cylinder and with the other one, she began to work on shifting the spring-loaded internal pins into their required position. At any moment, it would all be over. The doors of the house would fly open and people would come crashing in to get her - the unstable fugitive, the runaway lab rat. Hello, thanks for featuring 'Lie to Her' on your blog! I hope readers will enjoy its combination of psychological suspense and dark satire. Mehrisa, what can we expect from you in the future? I enjoy reading the excerpt! Congrats on the tour and thank you for the chance to win. Great excerpt! Really caught my attention.